Since the HD versions of these two games have full controller support through Steam, I decided to try and make a profile for the original versions also available through Steam using basically the same layout. Take note that you will need to change a few key bindings in these two games. "Use/Invoke NETRICSA" by default is bound to right click but they let you separate them to two separate keys. First you have to disable Use/Invoke NETRICSA by clicking on it's bound key and press ESC which will set it to None. Next to "Use" set it to "U"
Next to "Invoke NETRICSA" set it to "ENTER"
It might also help to change "Invoke computer" from "double click use" to just "use". The only think I have blank is the Dpad since the HD versions use it for direct weapon select and the games use a GUI to directly select weapons just like Half-Life 2 uses. 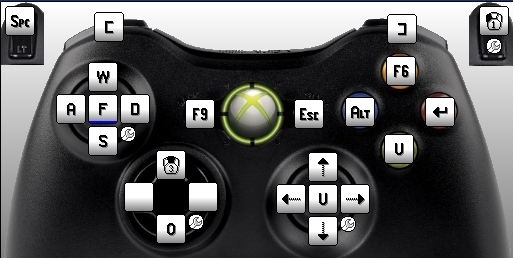 I'm open to suggestions on what the Dpad can be used for. Perhaps shortcuts to favorite weapons that you use often instead of having to scroll through the list to find it? 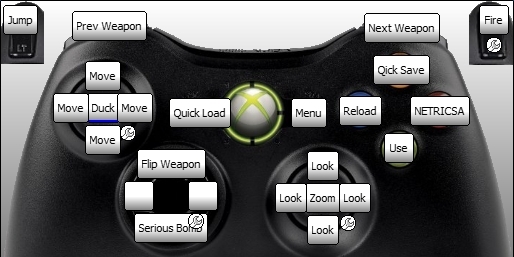 EDIT: I decided to add "flip weapon" to Dpad "Up" and "Serious Bomb" to Dpad "Down". Serious Bomb is only used in The First Encounter and Zoom is only used in The Second Encounter and is only available with the Sniper Rifle. Reload is only used for the Revolver weapon.